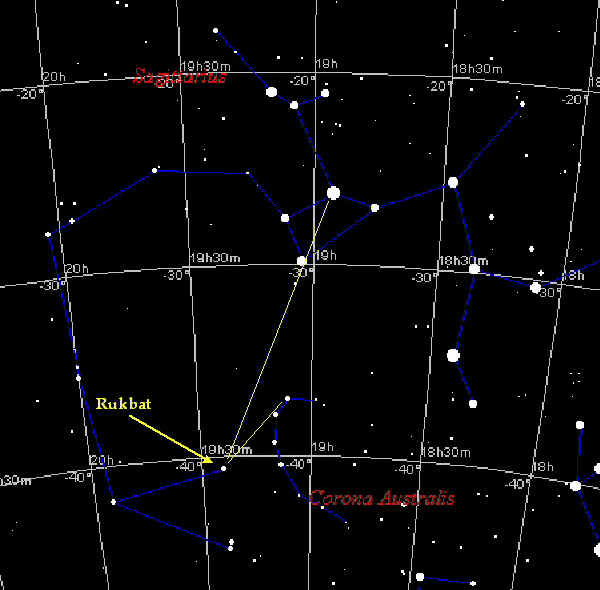 Pern's star, Rukbat, is a real star, found in the constellation Sagittarius the Archer. Rukbat means 'knee' in Arabic, the language in which most stars are given formal names. 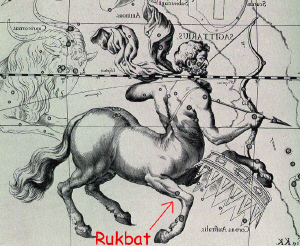 In the standard drawing of Sagittarius by Hevelius in 1690, Rukbat is located just left of the knee of the centaur's right foreleg (see left). Sagittarius is depicted as a centaur because of the constellation's association with the centaur Chiron of Greek myth. Rukbat's standard astronomical name is Alpha Sagittarius, which should mean that it is the brightest star in that constellation, but it's not--in fact there's several brighter than it--I'm trying to find out what the deal with this is. Anne reportedly picked this star from a National Geographic article because she liked the name. 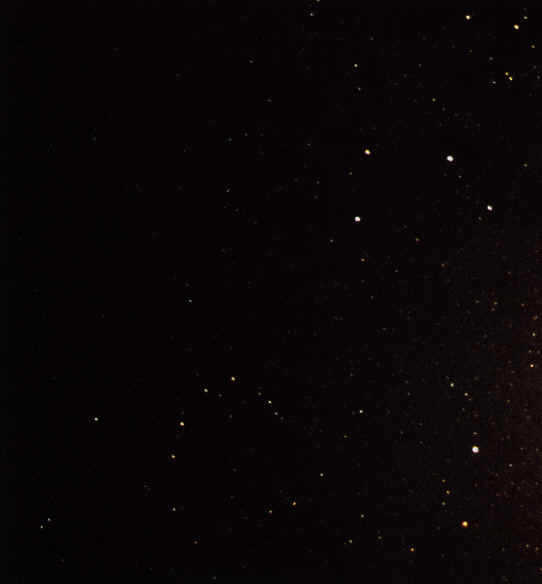 Although Anne wrote in the introduction to the Pern novels that Rukbat is a golden G-type star (as our sun is), the real Rukbat is in fact a blue-white B-type star. Rukbat is about 118 light-years away from us, and anyone traveling from our solar system to Rukbat would be going almost directly towards the center of the Milky Way Galaxy. Astronomer Steven Beard is working on a starmap of Pern's sky, which I think will be published in conjunction with the forthcoming Skies of Pern book (in April 2001). Our sun is not visible with the naked eye from Pern, but should be visible with a telescope or binoculars. Most of our constellations are not found in the same configuration in Pern's skies, but Steven says that Orion and the Southern Cross are recognizable. Below is a image of star chart from a shareware program called Skymap, to help you learn where in the sky to look for Rukbat. 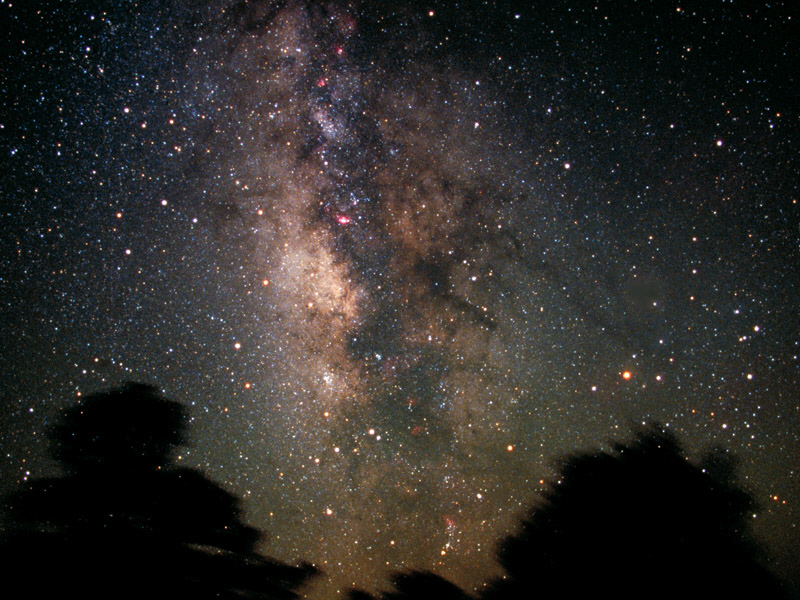 Sagittarius is a summer constellation (for those of us in the Northern Hemisphere). If your latitude is above 50 North, Rukbat won't appear above the horizon. Eventually I find a link to a star chart to tell you where Sagittarius is on different days & times. For now I've just got one specific date; Midnight, July 1st: Face directly south if you live in the northern hemisphere or between the equator and 40° south. If you live below 40° south, face due north. And if you're at 40° south, look straight up! The thin yellow lines were added to suggest a way to triangulate the position of Rukbat from more easily identified stars. Below is an actual photograph of the sky in this general location. It's rotated a little clockwise from the star chart. Can you identify Rukbat? If you position your mouse on Rukbat the arrow will change to a pointing hand. Site created and maintained by Cheryl B. Miller, copyright © 1998-2007, all rights reserved.